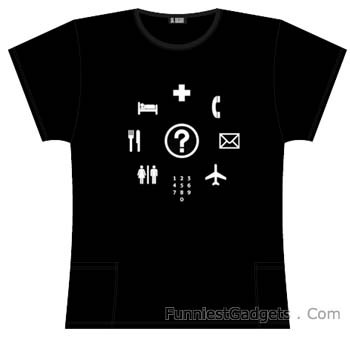 If you are traveling a lot and don’t always know the language of the country you are visiting, then this T-shirt is for you. ItÂ has a phrase book printed on it so justÂ point a finger at the pictogram you need and then point it twice at the question mark, which means, “Where is it?” and in no time you have found what you were looking for… or not. The t-shirt is great where can I buy one?